(Notes: The primary target August 9 was cloud-covered. The bomber crew went to the secondary target, Nagasaki, where a break in the clouds allowed them to drop the bomb. Lord: We pray that atomic weapons will never be used again in war. Yes, that's me. 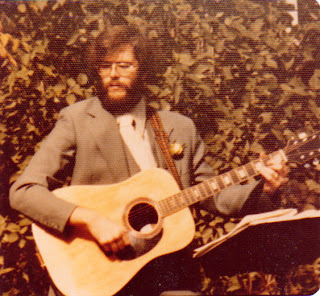 I was playing and singing at a wedding back in 1980! They requested all Dylan tunes. During 1992 two brothers, Magnus and Fergus MacFarlane-Barrow from Scotland, watched the TV news from the Bosnian conflict with increasing horror. They were so moved that they decided to organize an appeal for food and blankets. They quickly gathered a jeep load, joined one of the convoys leaving the UK, and delivered the aid to Medjugorje in Bosnia, a place of international pilgrimage they had visited with their family years previously. Believing their good deed done, they returned to their home in Argyll expecting to resume their jobs as fish farmers. However they came home to discover the public had carried on donating aid in their absence, filling their parents’ garage with goods. Magnus decided to give up his job for a year to drive the aid out to Bosnia for as long as the public kept donating. The public did not stop and it soon became necessary to set up a registered charity, Scottish International Relief (SIR). The charity soon expanded and began to work in Romania, building homes for abandoned children and, in Liberia, helping returning refugees by setting up mobile clinics, while continuing to deliver material aid to Croatia and Bosnia, and funding additional projects. In 2002 SIR was operating a simple famine relief project in Malawi when Magnus met a family that led to a whole new area of work. The mother was dying of AIDS and lying on the floor of her hut surrounded by her six young children. She said that all that was left for her was to pray for her children, that someone might look after them after she had died. She knew that the AIDS epidemic had created 1 million orphans in Malawi alone. When Magnus asked her oldest son what he hoped from in life, his stark reply of - “To have enough to eat and to go to school one day” was not easily forgotten. It prompted the campaign, Mary’s Meals. The campaign aims to provide chronically hungry children with one meal a day in school. In this way the children are encouraged to gain the education that can lift them out of poverty in later life. This simple but effective idea has gathered momentum and today provides daily meals for over 500,000 children in Africa, Asia, the Caribbean, and Eastern Europe. Mary’s Meals headquarters is still situated in the grounds of Craig Lodge in the Scottish Highands but support groups are springing up around the world. The Diocese of Rochester's Women's Commission is seeking new members. The Women's Commission serves as an advisory board to Bishop Matthew H. Clark, who appoints members to their positions on the commission. Members of the commission advise the bishop on issues of concern to women in the church and in society. The commission advocates for the role of women in the church and the community and provides its members with opportunities to share the richness of their gifts. Interested women are invited to apply to join the commission. Current commission members will review all applications and make recommendations to Bishop Clark. Nothing against the Women's Commission. I'm sure they do fine work and provide the Bishop with plenty of good advice. But are men unqualified to provide such advice? What about guys like me who raised daughters? And it seems to me that women are welcome to take part in groups that deal with issues of concern to men - like a vocation to the priesthood or the permanent diaconate. So why not men providing insights about women's issues? And is there a Men's Commission? Only open to men? After all, men have concerns these days, and I'm sure the Bishop could use some advice about helping guys with finding more opportunities to share the richness of their gifts. Maybe they could at least form a men's axillary to the Women's Commission. Possibly the men could wash the dishes while the women meet. Or maybe mow the lawn. I received the May/June issue of Gilbert Magazine today (yes, in Chestertonian style, the issue arrived on August 3rd). To my delight, one of my clerihews was published in it. would rarely crack a joke. 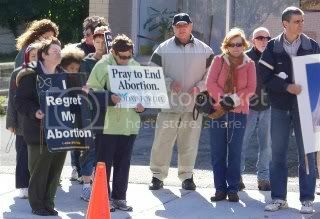 We're starting to gear up for the fall ‎40 Days for Life fall campaign (September 28 - November 6) in Rochester, N.Y. The first planning meeting is next Tuesday night at Focus Pregnancy Center - just down the road (University Avenue, actually) from Rochester's Planned Parenthood headquarters outside of which we will be praying for the 40 days of the campaign. Lives have been saved in the previous campaigns here in Rochester and across the world. Today is the Feast of Our Lady of Angels of the Portiuncula. Our Lady of the Angels is the Patroness of the Franciscan Family. The Portiuncula is an ancient church dedicated to Mary under the title Our Lady of the Angels and is located in Assisi, Italy. It was a spot very dear to the heart of Saint Francis. The Porziuncola is the place where Franciscanism developed, and where Saint Francis lived and died. The chapel, of antique construction and venerated for the apparition of Angels within it, belonged to the Benedictine monks of Subasio. It was on a piece of land called "Portiuncula" and later, the name of the land passed to the little church itself. It was abandoned for a long time and was restored by Saint Francis. It was here that he understood his vocation clearly and here that he founded the Order of the Friars Minor (1209) "establishing here his home", St. Bonaventure tells us, "because of his reverence for the angels, and of his great love of the Mother of Christ" to whom the little church was dedicated. The land and the Chapel were gifted to him by the Benedictines for making it the centre of his new religious family. On 28 March, 1211 Clare, daughter of Favarone di Offreduccio received her religious habit here from the hands of Saint Francis and so initiated the Order of the Poor Clares. In 1216, in a vision, St Francis obtained from Jesus himself the Indulgence of the Pardon of Assisi that was approved by Pope Honorius III. This plenary indulgence may ordinarily be gained on August 2 and 15; pilgrims may gain it once a year on any day of the year. At the Porziuncola, that was and is the centre of the Franciscan Order, St Francis assembled all the Friars in the Chapter every year to discuss the Rule and to renew their dedication to the Gospel Life. The Chapter of Mats (Stuoie) in 1221 was attended by more than 5000 friars. 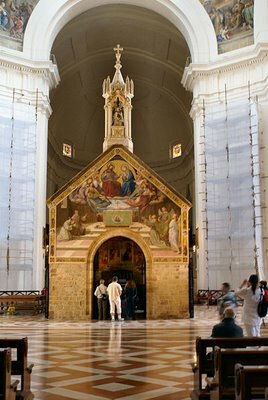 The Porziuncola is situated now inside the Basilica of Saint Mary of the Angels in the town of the same name around 5 km from Assisi. Here he began and grew in his religious life; here he founded the Franciscan Order; here he manifested his love and great devotion to the Mother of God. When Francis knew he was dying, he requested to be brought to the Portiuncula to end his earthly life. As we honor Our Lady of the Angels, may we find inspiration for our own growth and development in the Gospel way of life that Saint Francis embraced and lived so completly. To obtain the Portiuncula plenary indulgence, visit the Chapel of Our Lady of the Angels at Assisi, or a Franciscan sanctuary (like the "Port" at the Franciscan University at Steubenville - a wonderful replica of the original church), or even one’s own parish church, with the intention of honoring Our Lady of the Angels. While there, recite the Creed and Our Father and pray for the Pope’s intentions. You need to go confession eight days days before or after, and participate at assist at Mass and receive Holy Communion eight days before or after.